Talavera Factory Casa La Paz is still making Talavera pottery with the same traditional process that was brought from Spain to Puebla, Mexico over 500 years ago. Your hosts Salvador Rodriguez Loeza and his wife, Elia Percino Escalante are delighted to meet you when you enter their wonderland of Talavera pottery located in downtown, Colonial Puebla. Make sure you have enough time to fully take in all the pieces they offer for sale in the 4+ rooms that await you. 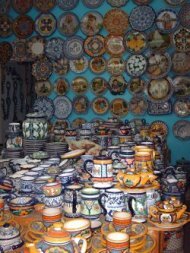 You will be in Talavera heaven browsing the thousands of hand-made pieces such as vases, clocks, covered casserole dishes, mugs, drawer pulls, bowls, crosses, tea and coffee services, even full 12 piece sets of tableware in the intricate and delicately painted patterns of Talavera. In Talavera Factory Casa La Paz you are assured that your Talavera pieces are made of the highest quality and are guaranteed not to crack or lose their finish for the life of the pieces. To read a detailed description of the Talavera process and it's history, please click on this fascinating link and then return to our page and read on! For the present time, Factory Casa La Paz does not have a website that you can visit, but in the near future you will be able to browse our website and even order online. But when you are visiting lovely Colonial Puebla we know you will want to visit us and take a tour of our factory and see the artisans at work, as well as spend many happy hours discovering the joys of Talavera shopping at its finest. Don't be afraid to carry these sturdy pieces home with you or send them through the mail; the original Talavera process guarantees that your pieces are of the most durable pottery available in the world. Thank you for visiting our page and please come to Puebla to visit us!.